Hey all! Proud owner of a new URSA Mini Pro (arrived Friday). I'll be releasing an unboxing video later today and subsequent testing videos this week. 1) On my unit, if focus peaking is turned on to shoot, it stays on for playback, and cannot be turned off without switching back to record mode. Is this a common error that can be fixed in the next firmware upgrade? 2) On my unit, the menu wheel and back button are entirely non-functional. Is that a problem with my unit, or have these buttons not been incorporated into the firmware yet? 3) It's nearly impossible to use the iris wheel when shooting from the hip with the screen out and turned up; any chance of getting an option to re-map the functionality of that button onto the menu wheel, which is more easily accessible? 4) It's very easy to adjust the little metal levers for ISO/shutter/WB up while shooting, but much more difficult to get my fingers in to adjust them down. I know this is a larger design issue, but I wanted to let your design team know about it. 5) When shooting 4K, Off-Speed Recording is of course capped at 60p. So the HFR button will only take me to 60p. But realistically, usually when I am going for HFR, I'll want to drop the resolution to 1080p with a sensor crop to get 120p. Any chance of an option on the HFR button to have it automatically make that change in settings to allow for 120p without digging into the menu, manually changing those settings, and then having to manually increase the Off-Speed frame rate up to 120p from 60p? 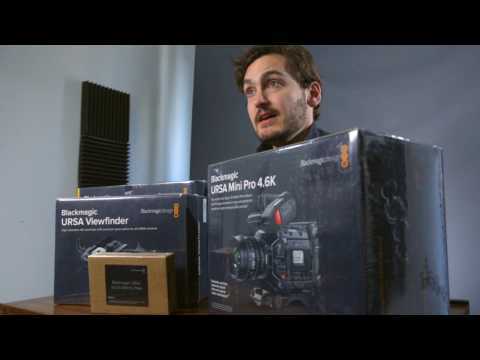 Overall, though, I'm impressed with the improvements from the URSA Mini to the URSA Mini Pro - so that very much to the BMD design team for listening to our feedback! 1. Focus peaking can be switched on and off when in standby at the moment but not in playback on the Pro. This is a bug which we are working on. 2. You can access and adjust things in the heads up display using the menu dial on your Front SDI when you have 'Status text' switched on for that output. This is intended for use with a viewfinder or an onboard monitor like a Video Assist. It includes the ability to adjust monitoring options, FPS, shutter, iris, ISO, WB and Tint quickly and easily without needing the touchscreen or going into the deep menus. 3. This dial is intended for use when the screen isn't out. If you can't access it you can use the menu wheel mentioned above to adjust iris, the LCD slider to adjust iris or you can map iris Up or Down to either of your function buttons, or even assign a specific f-stop to one of your function buttons to trigger straight to that iris setting. There are lots of options. 4. As you will have noticed we have packed a lot into URSA Mini Pro. If you are struggling with toggling down you could always map that function to one of your function keys which are just below the metal toggle switches. 5. This is not currently possible although you could set up a preset in the menu which is for 120p HD cropped shooting and switch to and from that very quickly. We will keep it in mind as a feature request. Overall, though, I'm impressed with the improvements from the URSA Mini to the URSA Mini Pro - so thanks very much to the BMD design team for listening to our feedback! Glad you approve Montgomery. Thanks for the kind words. We are certainly listening. Thanks very much for the quick reply & helpful information! Glad you're aware of the bug; understood on the dial. And of course I know you can't speak on all things that might happen, but it would be a huge usability improvement for me if there was an option to enable that menu wheel could in the future be used to adjust iris when shooting without a monitor through the Front SDI. And great suggestion on the preset; it's not as quick as having that option on the HFR button, but it's much faster than swapping to 60p on the C100 and at least on par with getting to 120p on the Scarlet Dragon. Much appreciated! Tim Schumann wrote: We are certainly listening. Tim, I wanted to ask if you guys have tested Zeiss Master Primes on the UMP to see if the LDS Metadata comes over. I know that you guys have said Cooke /i Metadata, but I want to know if Zeiss LDS also is able to work. Thank you! Aside from the audio issues I mentioned in another thread there is a problem that viewfinder peaking causes all the status info in the VF to glow red like a crazed demon. Is that unique to the UMP or is it the case any UM camera? Is it not fixable in firmware? I realize that if you turn on peaking in the Menu section of the camera that it doesn't affect the viewfinder status text and it can be programmed to one of the function buttons but that's not as convenient as the peaking button on the VF. Otherwise, and all in all, this is a brilliant camera with no serious issues I can spot so far, other than a very noisy camera mic. so it would be possible only if they'll offer an upgraded PL Mount and doing the required sw changes. Must be a feature of the Mini Pro. The Mini 4.6K PL firmware does not affect my white status information when I used the BMVF to toggle on red focus peaking at medium intensity. Ah, yes, I see. I'm curious does this mean that ARRI has two different PL Mounts on their ALEXA cameras to accommodate both Arri/Zeiss LDS and Cooke /i or did they figure out a way to have both pin positions in a single mount? Either way, I'm leaning on contacting SMPTE about pushing for a universal pin connection for lens metadata on the PL mount. I think we need to have standards that everyone can abide by. I honestly can't wait for PL lens metadata to become easy for all lens manufacturers to do on their lenses. It would be nice to have it be a universal technological convenience. rick.lang wrote: Must be a feature of the Mini Pro. The Mini 4.6K PL firmware does not affect my white status information when I used the BMVF to toggle on red focus peaking at medium intensity. Rick, perhaps I didn't state the issue clearly. it's not the camera that's adding the peaking to the staus info. It's the Viewfinder button and firmware. Understand that, David. I'm assuring you that when I use the BMVF button to turn on or off my leaking in the viewfinder, the display of the status information is not affected on the viewfinder. That's using the URSA Mini 4.6K PL camera. rick.lang wrote: Understand that, David. I'm assuring you that when I use the BMVF button to turn on or off my leaking in the viewfinder, the display of the status information is not affected on the viewfinder. That's using the URSA Mini 4.6K PL camera. Thanks. Got it. It must be a bug in the UMP's firmware, then. This is not a bug David it is expected behaviour. If you are applying peaking in the viewfinder over the top of an SDI feed that has the 'Status text' burnt in then it is expected that you will be applying peaking over the top of everything. You can switch peaking on or off at the camera in the menus, in the HUD menu (using the menu wheel) or you can toggle it using one of your programmable function buttons. Alternatively you can send a clean feed from the camera and then peaking in the viewfinder will not be over the top. We have not had a Viewfinder update since URSA Mini Pro shipped so there may be some information that does not come through correctly when applying your status text overlays at the viewfinder end, so as per the manual we recommend switching overlays off in the viewfinder and applying them at the camera end... this way their styling will also match the new software version 4 status information. It's been 4 days since I bought Ursa Mini Pro. However I also have some "issues" with the camera. I posted my own thread but got no answer yet, so since this thread is about issues on UMP I'll try to ask it here. Hope it's okay! I have horizontal lines on my UMP screen. It's especially visible when in lowlight and out of focus. As far as I can tell it's not visible on footage but on screen (I must test it some more). There's this guy on Facebook who posted the same issue this morning in Ursa Mini 4.6k & Pro group so I'm not alone in that. Is that normal? My Ursa Mini 4.6K never had that issue. Also, when on ISO 1600 and focus peaking on, I get a lot of red dots (I guess it reads noise and FPN which is if I may notice more visible on UMP than M4.6K) around the screen. Not only stuff in focus (which is dominantly marked by red) but randomly around the screen. Good point, Tim. I send a clean feed usually to the BMVF and use the BMVF menu options to enable and disable items. Love those three buttons: F1 Zoom, F2 Focus Assist, F3 False Colour. Couldn't live without them. Mario, the video noise is displaying as peaking, try turning down the leaking level, you have it set too high! Also, the UM46 and the UM Pro Re the same 4.6K sensor, one is not going g to be, more or less prone to video noise at ISO 1600 than the other. It's nice that there are three levels of peaking, but in practice I almost always use the medium setting. If you have a very controlled shoot, then the low level peaking will be the most accurate. High level peaking is misleading as I've definitely felt that it indicated things were in focus that later proved to be soft. But what about those horizontal lines on screen? Tim Schumann wrote: This is not a bug David it is expected behaviour. Indeed, \hat's what I've been doing. Mario, on the UMP I see no horizontal lines on the LCD screen at low light, out of focus. Then I have faulty display! Mario Belamaric wrote: But what about those horizontal lines on screen? I also have pretty intense horizontal lines on my LCD screen. They appear anytime I access the menu and then slowly fade. However, when I'm framing anything on screen, the lines come back seemingly in relation to whatever is on the screen -- for instance, if I am framing a lamp, the lines are throughout the display but more prominent on top of the lamp and below it. It's bizarre. The SDI output to other monitors don't do this, but for someone who is operating without a viewfinder (as of now), it's quite distracting! I hope BM finds a way to solve this with their next firmware update.